Darah’s completely bilingual (English/Spanish) and holds a B.S. in Cognitive Psychology and M.A. in International Relations. The devoted mom of five and wife of one, when Darah’s not mothering or “wife‐ing,” she’s a suicide prevention activist, youth development coach, keynote speaker, and author. Her highly-acclaimed debut memoir, Girl with the Crooked Smile – Stuck in a Moment, is a story that reveals what it really takes to weather life’s storms. It resonates with anyone who has had to muster up the courage and find the faith to press on through hard times. ***When not tethered to the washer or drier, Darah is passionate about reading in her hammock, exercising outdoors and listening to music. Yet above all else, she loves to watch her precocious children negotiate treaties with one another. Hello, Darah! Thank you for chatting with me today about your B.R.A.G. Medallion Book, Girl with the Crooked Smile – Stuck in a Moment. Tell me how you discovered indieBRAG and what has your self-publishing experience been like thus far? Hi Stephanie. Thanks so much for giving me a platform to rattle on. I discovered indieBRAG through a writer’s forum on LinkedIn and it came highly recommended for serious self-published writers. My experience so far has been great; Geri has been super enthusiastic, supportive and proud of her community of Medallion honorees, and I truly appreciate her obvious love and appreciation for quality writing and a good story. As you know, writing and the publishing is the easy part; it’s the marketing and promoting that comes with it and long after a book’s release that can become a full-time job if you let it. So I’ve had to let it go somewhat to pursue other related career objectives, and allow things to unfold organically. Please tell me a little about your story. Sure, it’s a memoir and chronicles a six-year stint that my family and I were beset with adversity of all kinds, and how we struggled to make it through together with our family intact. Girl with the Crooked Smile takes readers on an intense and moving journey that begins with my diagnosis of a brain tumor. At the time pregnant with the fourth of my five children and living in Latin America, I undergo surgery that steals the hearing in one ear and leaves my face deformed. But those concerns quickly take a backseat to dealing with the hardships that follow: a suicide, an armed robbery, a gruesome accident and a business collapse that leaves my family penniless. Somehow, by sheer defiance and an unbreakable will to survive, I fight to keep my sanity and family tight. And, along the way, find the strength to share my newfound insights and inspire others going through crises of their own. “Over a period of six difficult years, I had become a chameleon, a true master at adapting to the fluctuations of fate. A realist who never lost hope, I embarked each day on a personal journey to start fresh, as if yesterday’s bad luck never existed. All the suffering, stress and losses have made me into the person I am today. During this metamorphosis, I became a warrior as I traveled a labyrinth of instability and insecurity. When my life began to unfold like a soap opera, there were only two choices: adapt and plough through, or shrivel up and perish. I chose the former. My family looked to me to be strong, to hold it together. So I dove into a parallel reality and fancied myself a soldier. By evoking my rich childhood imagination and assuming the mindset of a combatant, I pushed on through years of darkness. Now, life was better. Our existence no longer was defined solely by a struggle to survive; conflicts that previously had zapped all our energies and time now almost entirely disappeared from our everyday life. A semblance of routine and stability filled the void of gratuitous chaos. The familiar cries of my loyal companions—anxiety and desperation—slowly died down. I found solace in writing. I preferred this form of communication above all others, perhaps due to my sensory impairments and inability to multitask. Throughout it all, I grew in character and depth. I learned to handle crisis like a full-fledged grownup. And despite this newfound adulthood, I discovered that even in the aftermath of radical life-changing experiences, a residual part of my former self still lingered. Somehow I would have to embrace it all and integrate the old, carefree dabbler with the new, war-torn me. Despite this existential tug of war that assaults my soul, each day I strive to channel a smorgasbord of emotions, destructive tendencies and impulses in a positive direction. Because if nothing else, I’ve learned that problems are disguised opportunities for personal growth. My overriding goal is this: discover what I am made of so I can strive to be the woman I want to see reflected in my children’s eyes. They and my loving husband keep me on task. My life force is driven by a hunger to be accountable to them. My story is just one of many that are testament to the unbreakable will of the human spirit. For so many of us, the struggles of the heart never end. We must trust in the process, for growth and character are born from pain and suffering. There are no ways around this, no shortcuts. An easy life will not yield the same results. Titles are so important in the overall package of making your book stand out. You have such a great title for your book, how did the title come to you? Your story touches on a few themes that hit home with many people’s lives-myself included. Was there any challenges about writing these themes and what would you like readers to come away with when reading your story? The challenge for me primarily was in finding time to write it and in finding the emotional space to really feel it. With five young kids and a great husband that likes to hang out with me, I had to get really creative. Usually, I’d stay up late or wake up early and guzzle obscene amounts of coffee at ungodly hours; I had to take advantage when I was inspired and in the flow. Because most the situations I had gone through and wrote about in my book were pretty intense emotionally and life-altering, as I write in my story, I’d become a robot, moving forward from crisis to crisis in a state of emergency without feeling a thing. When I had to sit down and recall the events, and connect spiritually, psychologically, emotionally, and even physically with them for the first time, years later, it was like giving birth to myself. It was the most cathartic and painful and draining experience I’ve ever been through in my life. A real paradox. And yes, most importantly, I wrote it for my community of readers, and for all the people out there who are suffering from what I call the human experience—adversity of any kind. I want them to know that if I, an ordinary person, could endure and even thrive through all that I did, anyone could. As stated at the beginning of the interview, once you observe yourself overcome one of life’s hurdles previously deemed impossible, you emerge stronger, more self-confident, and more resilient. You become infused with love and gratitude for what still remains. Your story begins in Barcelona, Spain, and then moves between Costa Rica, Panama, New York, and South Florida beginning in 2000. What are some of the cultural comparisons made between these countries? Whoever has lived in a developing country as an ex-pat knows that you must have reserves upon reserves of patience. Because as a rule of thumb, nothing will go according to plan and many times, the rules are mere suggestions. Thus, if you begin with that premise in mind, you’ll be elated when things do work out as they should. Personally, I had to bend and transform and re-invent myself as a type-b in order to navigate these foreign soils like a local. So I did and buried the old type-a-gotta-have-it-my-way-now-and-perfect. In all seriousness though, I learned a lot in those warm Latin cultures, particularly, how to enjoy life and just be and that spending time face-to-face storytelling with friends over coffee is time well-spent. Back on US soil since November of 2008, I sometimes catch myself feeling guilty if I spend time having coffee or lunch out with a friend, as if I’m not busy enough and have no right to such pleasurable downtime. When those admonishing thoughts creep into my mind, I quickly shut them down. What is the historical significance in your story of the Rebbe and Lubavitch movement? We were, at the time of my diagnosis of the brain tumor, practicing Orthodox Jews and had the support and prayers of an entire community back in Panama. The movement we followed was the Lubavitch one as I am of Ashkenazi lineage, which means my ancestors came from Eastern Europe prior to settling in the US. It’s a very beautiful and spiritual perspective and brought us much comfort at first, while we were in the thick of it. I wanted to share with readers a bit of insight into the history and teachings of this Old World looking sect of Orthodox Jews whose monochromatic wardrobe belies the colorful richness, joy and depth of their spirituality and customs. I wrote a blog called Warrior Mom – Straight Talk from the Heart. Initially, it was purely for therapeutic purposes; I craved an outlet for my grief, confusion, and rantings, and psychotherapy was financially inaccessible. I was overcome with culture shock, experiencing motherhood and life in the US after eight years away. Essentially, I’d become a foreigner in my own country. When I decided to get serious about putting it all into a book—at the urgings of many of my blog readers—it took no less than three solid years of revising, editing, tweaking and rewriting the whole darn thing. I would write anywhere, and I mean anywhere. Sometimes I’d scribble on notebook paper while the kids slept in an idling car; I’d write seated in the bathroom. Many times, while my kids were tuned into something on television, I’d plug up my hearing ear and close myself off from the world—seated in the middle of the fray in our tiny rental. Oh, I am working on several initiatives at this time. Primarily, I focus on youth development and build leadership and life skills programs that encourage kids to think outside-the-box, and become globally savvy and confident navigating an international milieu. In aaddition, I love to speak and inspire others and recently delivered several keynote addresses at suicide prevention fundraisers. My incurable wanderlust has taken me in a new direction as of late and together with a partner, we are building strategic alliances with local communities in the developing world so we can take offer unique, enriching volunteer travel opportunities to students where they’ll also earn community service hours. I sell signed and dedicated copies on my website . They are also for sale on Amazon , barnesandnoble.com, smashwords, and are in all digital formats: Kindle, Nook, iBook—you name it. Thank you, Darah! It has been a pleasure. Thank you, Stephanie, for the opportunity! We are delighted that Stephanie has chosen to interview Darah Zeledon, who is the author of, Girl with the Crooked Smile, our medallion honorees at indieBRAG . To be awarded a B.R.A.G. Medallion TM, a book must receive unanimous approval by a group of our readers. It is a daunting hurdle and it serves to reaffirm that a book such as, Girl with the Crooked Smile, merits the investment of a reader’s time and money. 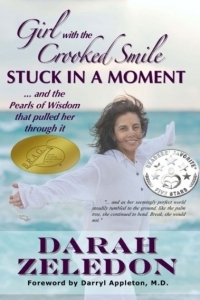 This entry was posted in Uncategorized and tagged Author Interview, Darah Zeledon, Girl with the Crooked Smile, indieBRAG, Memoir, self-publishing by layeredpages. Bookmark the permalink.